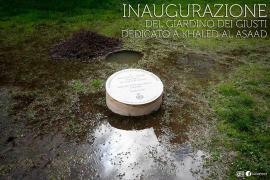 The Municipality of Civita Castellana, in the province of Viterbo, has inaugurated the Spread Garden of the Righteous of Civita Castellana. Every year, regional schools will plant olive trees and will install memorial stones in their gardens. On the European day of the Righteous 2016, Khaled al-Asaad and Anna Politkovskaya have been honored in the gardens of middle school Dante Alighieri and high school XXV Aprile. Local institutions, authorities and schools of Civita Castellana, and in addition, Bianca M. Tomassini Pieri, an orientalist archaeologist who has worked in Syria for over ten years, and Federica Angeli, journalist of La Repubblica, attended the ceremonies.